It’s taken a few weeks of planning but today a small working party consisting of myself, Colin (M1EAK), Yan (M0YNK), Chris (M6GSD) and Kevin (M0GWE) descended on my house to take down the mast with my VHF beam and move the 10m 5/8 wave to the standoffs the VHF aerial was on. That was completed with only a little cursing due to the weight. The end result is that because of the positions of the standoffs, that aerial is now approximately 3ft lower than it was before so I need to address that in the future with a longer pole. Compare this picture with the one on my qrz.com page and it all looks a bit bare there now. 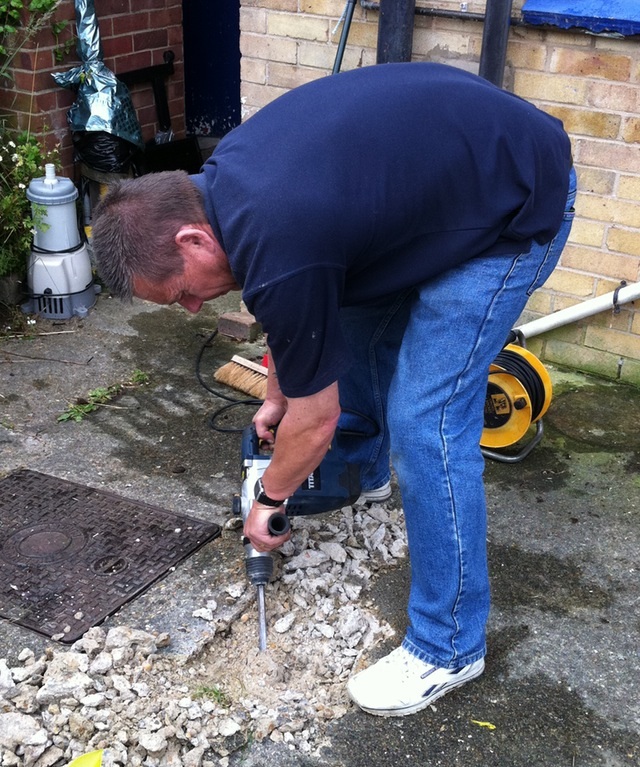 Another task planned for today was for Colin to drill through my patio to see how thick the concrete is and to decide whether it has to be lifted in order to fit the base for my new Alimast from Aerial-Parts of Colchester. It turned out that the concrete is just a few inches thick and although that might be enough I’d already decided that if that was the case then I would fit a new base. I knew it would be a lot of work but it would be worth it. 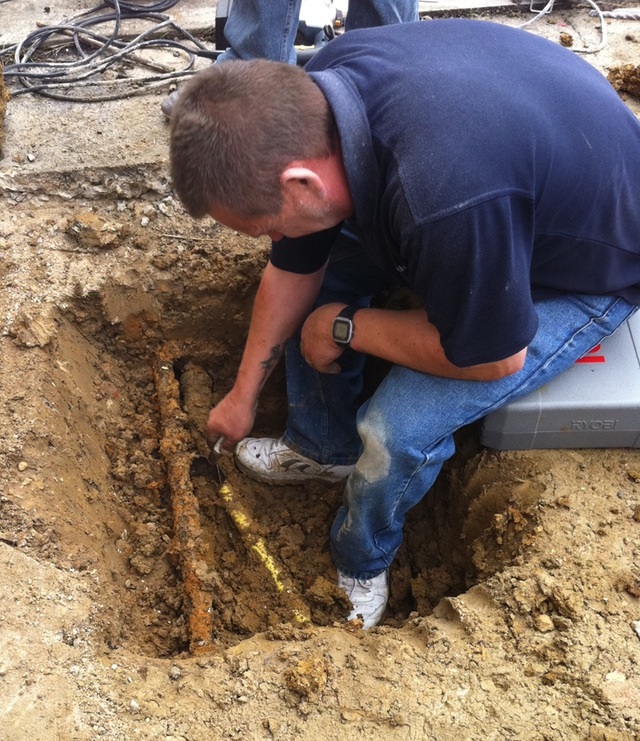 Colin decided that he’d start work on the base area straight away so he grabbed his tools from the car and set to work. 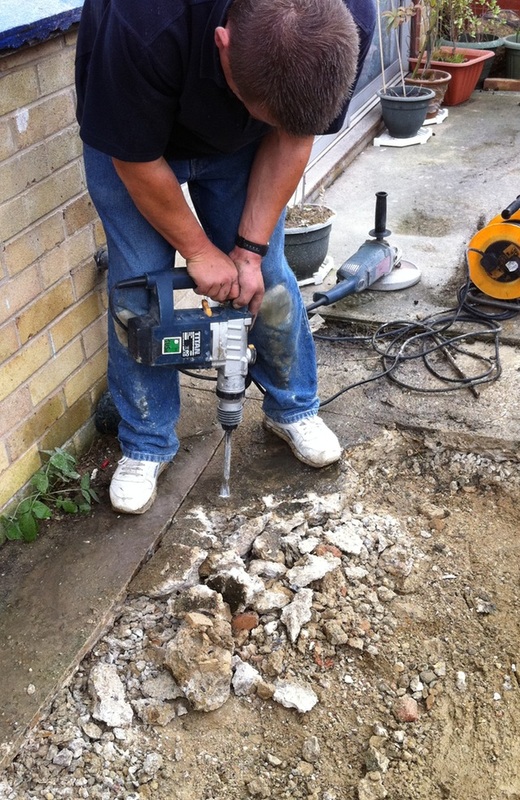 First he marked out the area of concrete to remove and cut that with a diamond cutter and then it was time to get his mini Kango out and start removing the concrete. M0GWE and M1EAK - Note the standard builders cigarettes dangling! 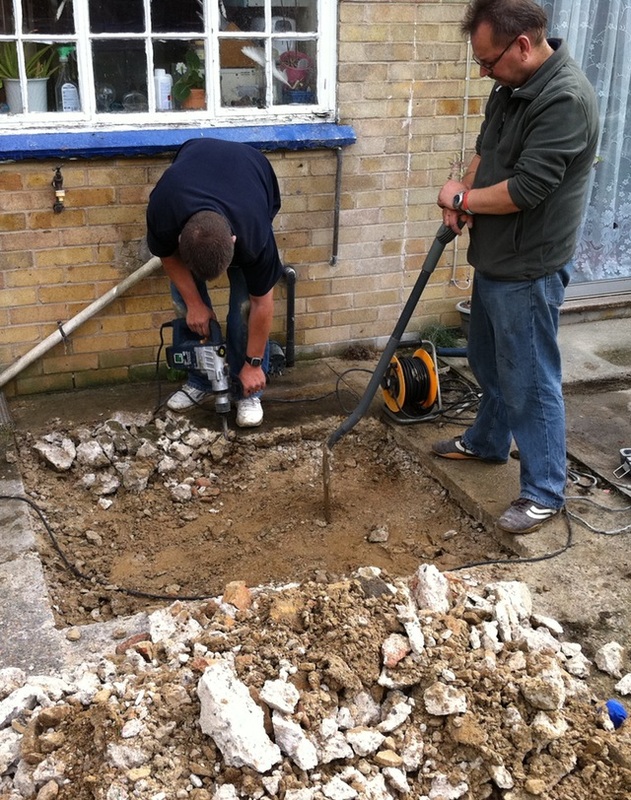 Once the top layer of concrete was removed it was time to dig the hole for the base for my Alimast. 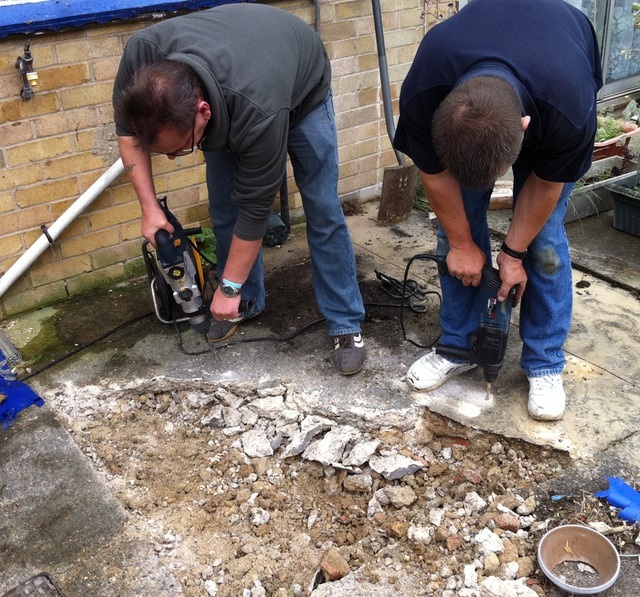 We were expecting to find one pipe down there but were surprised to unearth another. Both of these will be properly sleeved and the appropriate indications will be left in the new concrete we lay. This is what I ended up with and what will be in my garden until next weekend. It’s a hole to be filled with concrete for the base of my new mast from Aerial-Parts of Colchester and the whole top of the patio will have a nice new surface. 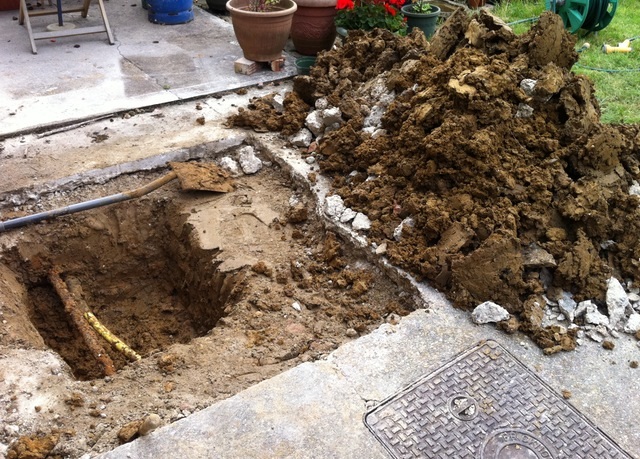 You can clearly see the huge mound of earth and rubble next to the hole which I have to dispose of. I’m thinking that the best way to do that will be to dig another hole to put it all into. I really must thank everyone who helped today, I couldn’t have done all this on my own. 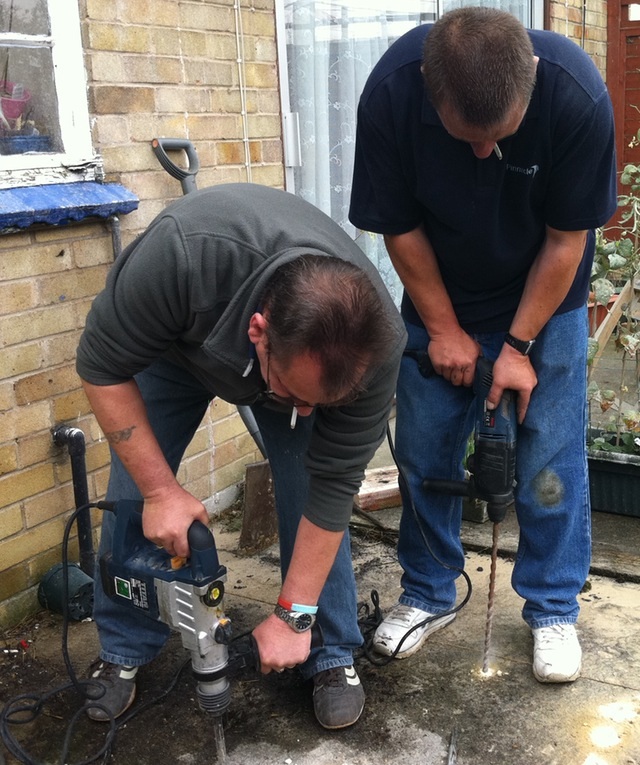 Colin and Kevin deserve a special mention as they did all the work removing the concrete and digging the hole. 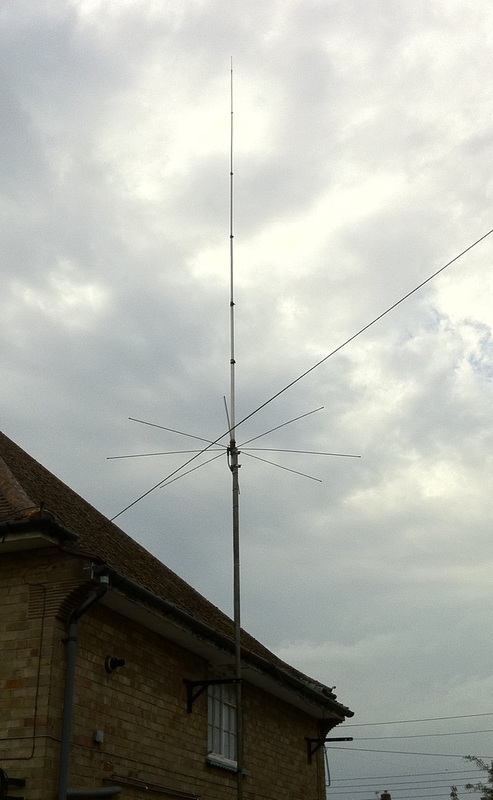 This entry was posted in Amateur radio, Construction, Sponsorship and tagged Aerial-Parts of Colchester, Alimast. Bookmark the permalink. I’m a bit concerned that if the concrete base moves independantly of off the surrounding area you’ll break/damage the pipes. Essex clay is know for it’s “heave” pity you couldn’t come out a bit more. We did just that. We sealed the pipes back in good old Essex clay and moved the hole further away. It means the mast will sit slightly further away from the house but that’s not a problem at all. I’d much rather be safe than sorry. You could have made a few bob when you done the dugout catching all the worms and floging them to the anglers,lol. Done a great job mate.